June 29, 2016 July 1, 2016 caththebruceLeave a Comment on 100daysofgrievances #45 GRANNIES AND THE MISSING THEREOF. 100daysofgrievances #45 GRANNIES AND THE MISSING THEREOF. Everyone loves a Granny because grannies are great. They are fountains of all sorts of useful knowledge (often pertaining to baking times, crossword clues and the fixing of random things), they have sayings that are just what you need to hear when things are all kinds of rubbishy (“Whit’s fur ye’ll no go by ye”), or undecided (“If you’re not in your bed, you’re in your shoes; therefore, it is completely acceptable to spend lots of money on either of those items), and they get away with saying things that the politically correct younger generation refuses to (“Her glands are making her fat, you say? Isn’t it weird how nobody had gland problems in the concentration camps?”) What is more, they start many a sentences with that most excellent phrase “Back in my day…” None of these sayings can be attributed directly to either of my grandmothers, but I think they evoke the very essence of grandmotherliness, as does that classic childhood song which I now have going round and round in my head: ‘Ye canny shove yer Grannie off the bus’ (if you’re not familiar with this Scottish favourite please do Google it. I promise you won’t regret it). I’m not sure if it’s a trait common to all women of that generation (or just members of my immediate family), but both my grandmothers like(d) to feed. Gran is 90 and still makes a mean ginger biscuit, the best cheese scones in the world and Yorkshire puddings to die for. Granny Bruce lived into her 80s and even in her final year, would regularly turn up at the door distributing extra strong mints and homemade biscuits and puddings, her mobility scooter laden with various jars of jam and marmalade. It’s probably best we don’t dwell on the havoc she liked to cause aboard that vehicle… Put it this way, if ever Girvan main street came to a standstill, there was a distinct possibility that it was something to do with my newly-mobile yet devoid of all road-sense (and exceedingly deaf) grandmother. She would unload her wares and then fill the basket back up with empty jars and any old fruit that would otherwise be headed for the compost bin and might ‘do for a crumble’. Anyone who has been to my house for dinner knows that I am something of a feeder, too. I like to think I learned from the best. Granny didn’t really believe in measuring stuff, and by that I mean she didn’t weigh ingredients and was certainly no slave to a sell-by date. When it came to her legendary flapjack, her standard modus operandi was, if in any doubt, to scrape in some more Lyle’s golden syrup (from an ancient-looking, dented, rusty and seemingly bottomless tin, complete with crystalised syrup clinging to the sides), or some more melted butter. Usually both. I followed my recipe to the letter. I’m not going to post a link to it as it was a rubbish recipe. The resultant flapjack was tasty but not quite chewy or indulgent-tasting (okay, bad for you) enough. Next time I will go with my gut and add extra melted butter and lashings more golden syrup. Alas, my syrup was not from an old dented tin of questionable vintage, but instead from a squeezy M and S bottle. Oh how times have changed. I’m not even sure you can still buy tins of Lyles, although when I was attempting to procure my ingredients, I did notice that they now boast a fine range of dessert syrups (I do like a dessert syrup as you may recall from my holiday buffet themed rantings, although on this occasion I managed to resist). It would appear that syrup has gone all fancy, but so too have recipes for flapjack. Gone are the days when flapjack was flapjack – a quick Google search resulted in recipes for apricot and chocolate flapjack, fig flapjack, golden flapjacks with mango, sour cherries and coconut, to name but a few. Granny would categorically not have approved. Whilst I very much doubt that Granny would have been convinced to experiment, there is every possibility that she would have had at least a few of those additional ingredients languishing at the back of a kitchen cupboard (perhaps not the mango, but certainly some gungy glace cherries, and without a doubt, a supply of desiccated coconut – probably not in its original packaging, nor entirely recognisable as such, but coconut nevertheless). When Granny was in her late 70s, she moved house. Dad gave me the job of ‘sorting through’ the food and throwing out the stuff that he didn’t think we should expend energy relocating. Now, you have to understand that my dad is not a stickler for a sell-by date, and was always an enthusiastic recipient of Granny’s supermarket bargains: bashed tins with no labels; a year’s supply of mini Xmas puds every January (“ideal for taking up the hills, ignore the Best Before date, pudding improves with age”); discounted Easter eggs (the only time she ever bought them was after Easter. On the day itself, she would present us with multiple massive bars of Galaxy – “more chocolate for your money”); etc. I do like to think that some of this common gumption rubbed off on me! Back now to that afternoon in Granny’s kitchen… If I tell you that despite Dad’s predilection for a bargain, and his casual indifference towards a suggested Eat By Date, his instructions to me were: “Anything with prices on in old money, put right to the bottom of the bin bag so she’s less likely to notice and take it back out. And if you can’t work out what’s in the tin, chuck it”, then you’ll get some idea of what we were up against… Despite our attempts to the contrary, when it came to unpacking the kitchen, Granny’s full repertoire of aged baking ingredients and magical mystery meals once again took up residence in her kitchen cupboards. Whilst she was the mistress of the wide-eyed straight face (“Catherine’s dress for the school dance? Shorter? No, she must have grown. Wasn’t I just saying they’re all shooting up? All towering above me now! My sewing machine? Oh I moved it over there to make room for a plant. Of course I didn’t shorten her dress. I agree, quite short enough…”) there was no pulling the wool over her eyes. I’m probably not alone in the fact that the taste of tea from a flask evokes vivid grandparent-themed memories. 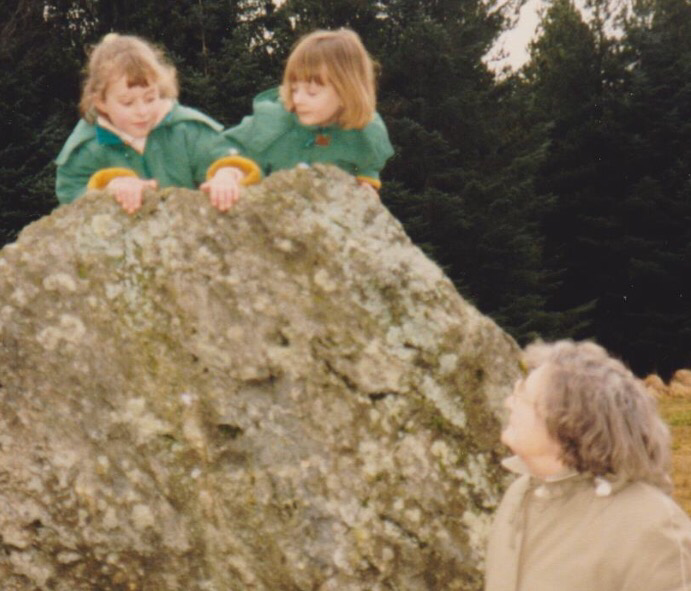 People of a certain age were once as attached to their flasks of tea as we are to our smartphones today (but again, perhaps that was only my family…) Granny B. took it one step further, she never stopped at a simple flask… On one occasion, Dad and Granny and Wee Sis and myself went ‘up the hills’ (a normal weekend activity where I come from…) We did some walking (and, no doubt, some clambouring over boulders) whilst Granny sat in the car and enjoyed the view from whatever farm track we’d parked on. We eventually tired of clambouring and returned grubby and hungry to the car, only for Dad to announce to much noisy indignation that he’d forgotten the sandwiches. What a catastrophe! Granny calmly and quietly sat down her flask-top cup and opened her voluminous handbag. From there she removed some buttered bread (white, of course – “Don’t tell your mother”), a tin of hotdogs and a tin opener, a little pan and … Wait for it… A small camping stove complete with a spare gas canister. I don’t think a meal has ever tasted better! I occasionally wonder if she always carried tins about with her in case of emergency… There was definitely a constant supply of biscuits in that Mary Poppins bag, and mints…But still room for an unlabeled tin or two! 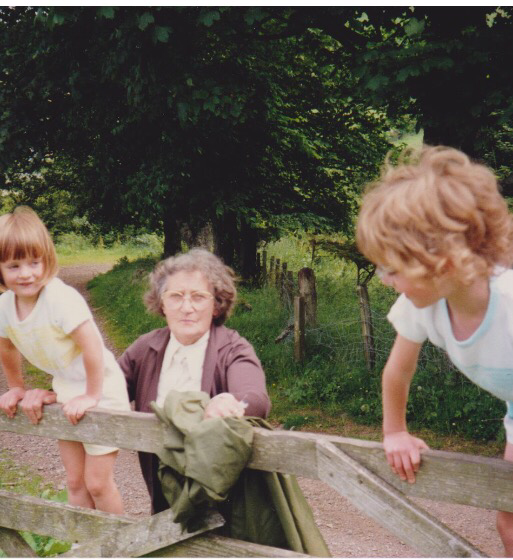 As is probably clear by now, many of my Granny-themed memories materialise when I see or smell food. At home, the only chips we ever had were those horrible McCains oven chips of days gone by. This was back before the invention of the all-singing all-dancing Southern Fried, spiral-cut, crispy, tasty ones, when oven chips somehow managed to be simultaneously brick hard on the inside and slightly soggy on the outside. No amount of ketchup could disguise their fact that they were massively unappetising and the term ‘treat’ was a veritable misnomer. Granny wasn’t remotely interested in newfangled inventions such as the oven chip. Instead, she would fire up the chip pan (containing oil that Wee Sis and I were entirely convinced was the same oil she had used when Dad was a boy), and present us with steaming platefuls. We’d drag ourselves away from our trays of flapjack to sit down and dig in, simultaneously reassuring Granny that no we wouldn’t tell Mum, that if she smelled the chip fat on our clothes then we definitely would NOT say that we were in the kitchen when they were being cooked, and no, of course we wouldn’t tell her we were allowed to stand on chairs to stir the pan of marmalade! Anyway, that was ages beforethe chip pan came out. Chips at Granny’s house were great for 2 reasons: 1. they weren’t oven chips and 2. We were allowed salt on them. We never had salt at home, I’m not entirely sure why, but we were clearly deprived children. One of my earliest memories of my sister is standing in Granny’s kitchen and watching her repeatedly tip salt onto her hand before licking it off. She also liked to add extra salt to packets of crisps (again, could only be done at Granny’s), but that is entirely besides the point. I don’t want you to get the idea that we didn’t consume anything healthy at Granny’s… On the contrary, a massive section of her garden and greenhouse were given over to peas, tomatoes, strawberries and gooseberries. She was as stubborn as they come – in her later years she could barely walk, but that didn’t stop her spending hours on her hands and knees tending to her beloved garden and ensuring that we would have our pea crop the following year! We’d happily sit for hours picking, shelling and eating the aforementioned snacks, all washed down with milk (full fat of course, not the semi-skimmed stuff we got at home) which we were encouraged to drink through chives. At the time, I did not think the chive thing was remotely weird, yet as I write it, I am now questioning the sanity of my entire family. On another rather memorable occasion, we were at the graveyard visiting my late-Grandad’s grave and Granny was incensed when she spotted a variety of discarded bouquets atop the compost heap in the corner. She went over to investigate, plucked the best specimen and took it home to give to my mum. You can imagine Wee Sis’s and my glee as we announced to Mum “Granny got your flowers from the graveyard”…. Allow me to return briefly to the subject of plantlife. Interestingly enough, Granny’s view that flora should rightfully remain where it grew did not extend to any plants that she desired a cutting of… An extremely keen gardener with a truly stunning garden, she would regularly take some sort of gardening tool (clippers, is that what they’re called? Secateurs?) from her bottomless bag and snip a cutting off a plant whilst out and about. This wasn’t an issue if it was in our garden, but it became slightly more of a concern when the parentals noticed her bag bulging with greenery after a walk round a private garden, famed for its abundance of rare species. The cuttings would be taken home and lovingly nurtured in pots all around the house, the garden and the greenhouse. One had to walk with great care around Granny’s house, especially in the vicinity of any windows, for it was far too easy to trip over a wayward plant pot. When Granny went on holiday, ‘watering the plants’ required stamina, strength and about 84 trips to the sink with her massive watering can. Tonight I’m going to have another bash at bakery. I think I might attempt a tray of shortbread, as mentioning it earlier has made me crave it. Maybe I’ll channel my inner Granny by putting the TV up really, really loud (on the occasions when she knew where they were, her hearing aids never seemed to work properly).